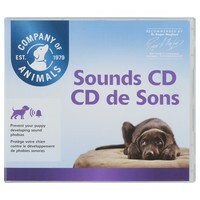 Company of Animals Sounds and Noises CD is for behaviour therapy as a proven technique for the treatment and prevention of sound phobias in dogs. If your dog quivers every bonfire night, shies at traffic or hides during thunder storms then this is probably the most helpful tool you can have. With 30 tracks and a guidance booklet you can help you pet overcome their fears. Played on a regular basis beginning at a very low volume and gradually increasing the volume and duration over a period of time you can desensitise your pet to the noises they fear the most. This vet approved CD is also ideal for playing to puppies in order to prevent the fear of these noises developing. Bangs: Fireworks (4 tracks), Thunder, Gunfire, Crow Scarer etc. Transport: Planes, Sirens, Motorbikes, Trains, Cars etc. Household: Lawn Mower, Washing Machine & Vacuum Cleaner. People: Children playing, Babies crying & Crowd/Party noises. i think my dog is just to clever as she didn't bat a eyelid when i played the firework section. even when i played it upstairs she seemed to know the noise was coming from a machine and not the sky s i didn't find this cd helpful for her. on the plus side tho, it seemed to help with my cats.